In the Spring of 2011, I bought a small greenhouse from Costco so I could plant some veggies early and maybe get some more productivity. 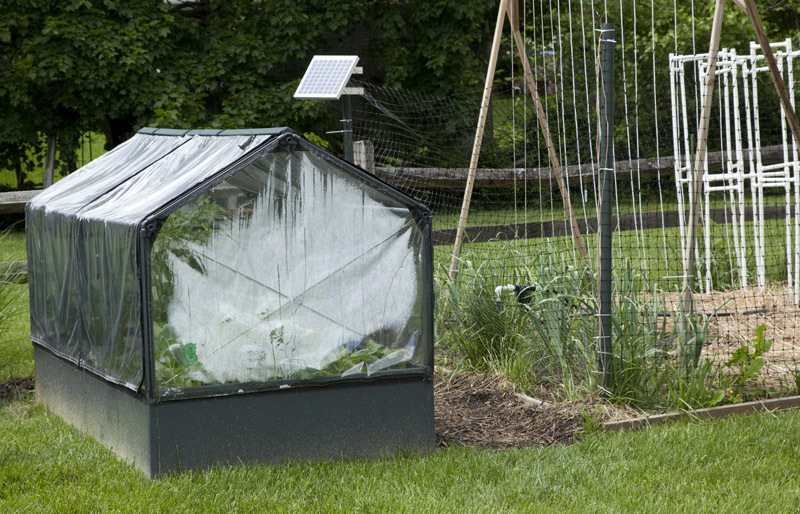 About that same time, a friend sent me a link about using an Arduino to control a camera for high speed photography, and I thought that the Arduino would be the perfect tool to understand how effective this new greenhouse is. I currently have drip irrigation in my other vegetable gardens running off a timer and I’ve put the greenhouse on the same water line. Unfortunately, the greenhouse needs a lot more water than the outside garden, so eventually I will be operating a water value with the garduino to control the water going to the 2 gardens. Here are a few things I’ve learned. First the TSL235 I’m using are too sensitive to use to measure sunlight. They saturate, and I will have to replace them with TSL230 (the light sensor output frequency is plotted on the left axis). The moisture sensors are pretty much worthless right now, but I’m going to be trying several designs to hopefully find one that works well. The temperature sensors are the only thing I’m happy with at this point (they are LM335’s). What I learned from them is interesting. 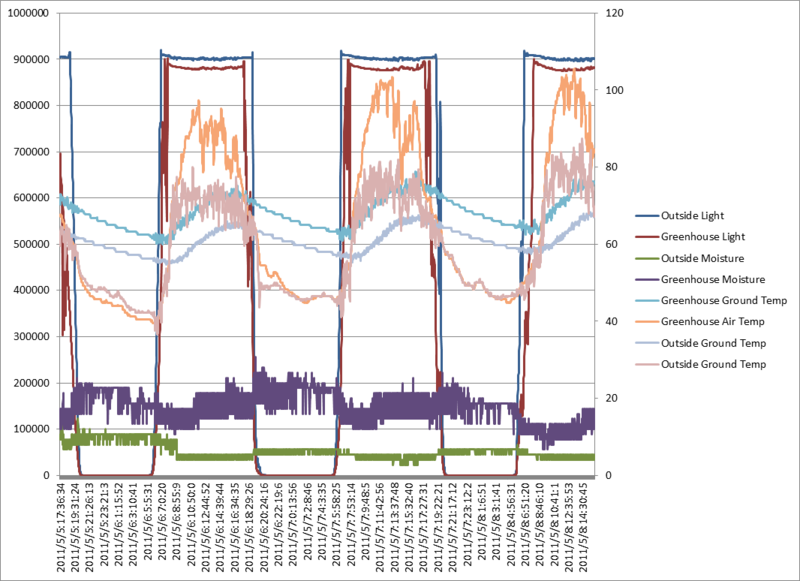 During the day, the air temperature inside the greenhouse is up to 20 F warmer than outside (the Temperature is plotted on the right axis), but at night, the air temperature both inside and outside the greenhouse is the same. The ground temperature, though, is alway about 5 F warmer in the greenhouse than outside it. Future posts will discuss all the sensors and other elements of my Garduino in detail, and hopefully the improvements I make along the way. This entry was posted in Garduino and tagged Arduino, Costco Greenhouse, Garduino, Solar Power by kevinmkessler. Bookmark the permalink.